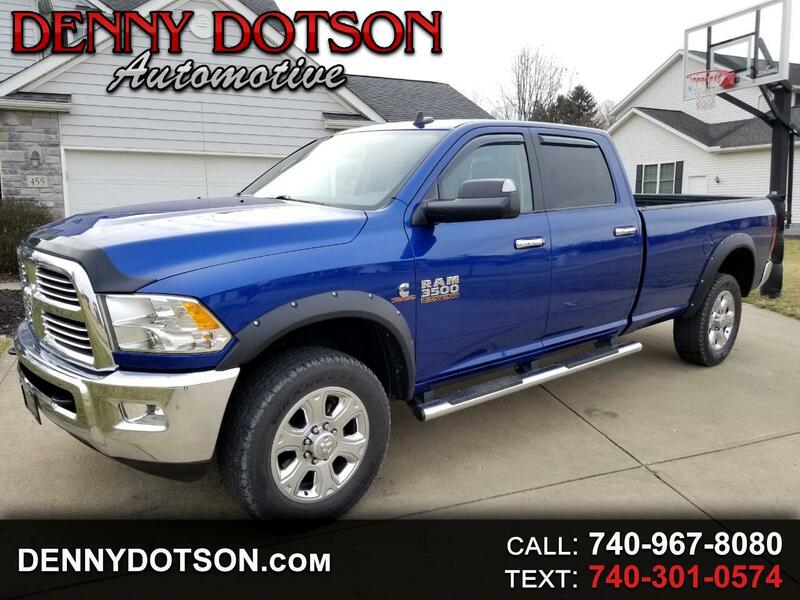 Used 2015 RAM 3500 4WD Crew Cab 169" Big Horn for Sale in Johnstown OH 43031 Denny Dotson Automotive Inc. Here's the hard one to find you have been looking for. One owner 2015 Ram 3500 Crew Cab Long Bed Big Horn Diesel. Has all of the right options. Big Horn Pkg, Luxury Pkg: folding power black mirrors, heated seats, comfort group, heated steering wheel, cold weather group, 220-Amp alternator, transfer case skid plate, 5th wheel /gooseneck towing prep, ASIN(865 lb-ft) 6 speed automatic transmission/3.42 rear axel ratio, 180 amp alternator, Ram active air, selective catalytic reduction, center high mount stop lamp with camera, Uconnect 8.4 Touchscreen display, Uconnect Access, GPS Navigation, Media hub, 9 speaker sound system/subwoofer, 20" factory polished alloy wheels, rear park assist, back up camera, power adjustable pedals, and spray-in liner. Bone stock with zero modifications. Super hard truck to find(specially with the low mileage). Clean one owner history with no accidents. Comes complete with all of the books, manuals, original window sticker, and both sets of keys. Visit Denny Dotson Automotive Inc. online at www.dennydotson.com to see more pictures of this vehicle or call us at 740-967-8080 today to schedule your test drive. Message: Thought you might be interested in this 2015 RAM 3500.